Following on from my post on Mather and Platt’s foundry, the (only?) other evidence of East Manchester’s engineering past are the boiler shops of Beyer Peacock’s Gorton Foundry. 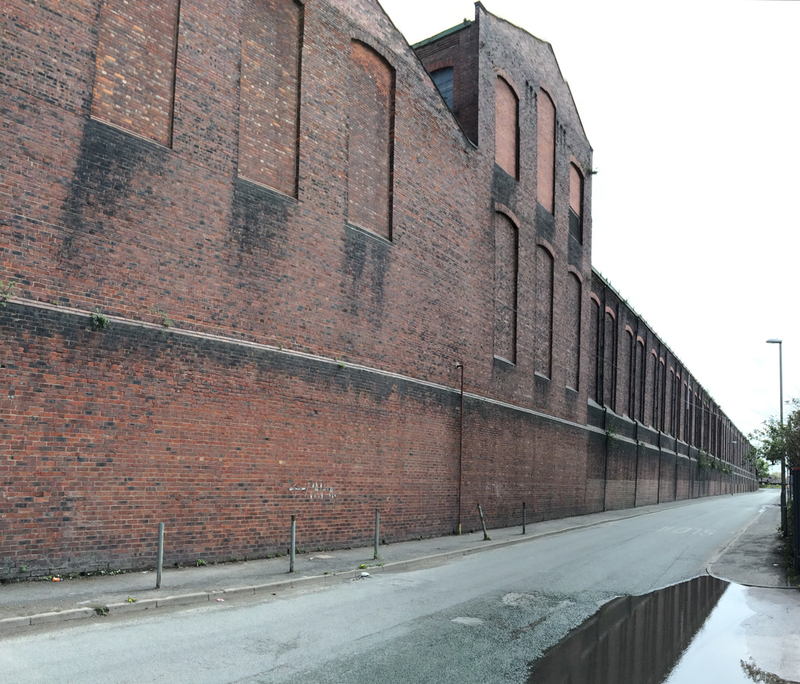 Like Mathers, the majority of the site has been demolished, but maybe the most significant part still remains and is used as a depot by Manchester City Council. When railway enthusiasts discuss the great locomotive works, it is the railway companies own works that spring to mind – the GWR at Swindon, the LMS at Crewe, Derby and Horwich, the LNER at Doncaster, The Southern at Brighton and Eastleigh, etc. Unlike America, the British railway companies were largely self-sufficient in terms of locomotives and often rolling stock as well. This contrasts with America, where with a few notable exceptions such as the N & W, most locomotives were bought from companies like Lima, Baldwin and Alco and later on General Motors in the diesel age. But the private manufacturers in Britain were many and varied and while the domestic sales of their products was comparatively limited (with the exception of industrial steam which was a large market), the rest of the world provided a huge market. And while the British empire was a huge importer of British made engines, engines were also exported to North Africa and in large number to South America. The works of North British in Glasgow, Vulcan Foundry in Lancashire, Robert Stephenson in Newcastle, Kitson Meyer in Leeds and many others built tens of thousands of locomotives in all shapes, sizes and gauges for export all over the world. One of the most successful was the Manchester firm of Beyer Peacock. Their ‘conventional’ loco’s were successful in many markets (and can still be seen running daily on the Isle of Man Steam Railway) but the company is best known for its unconventional looking Garratt locomotives, even though they represent only 1000 or so of the company’s total output of 8000 locomotives. The Garrett concept was the invention of Herbert William Garrett, a British locomotive engineer who had spent much of his career overseas on the railways around the empire. This experience of the conditions experienced on these railways allowed him to devise the concept of the articulated locomotive, a creative leap based on seeing articulated gun carriages. articulated locomotives were not new, with the Fairlie locomotives on the Ffestiniog having been around since the 1860’s. What was different though was the physical layout and the scale of the thing. Normally a large boiler, as required by a powerful locomotive, would be mounted above the frames to which the wheels were attached. So a long boiler would require a long frame with lots of wheels to support it, thus creating a heavy loco that couldn’t go round tight bends. However, by suspending the boiler between two small articulated bogies at the front and end of the boiler / firebox / cab unit, it was possible to create a paradox – a very long locomotive with a short wheelbase (well, two to be specific). It was also possible to increase the width of the boiler as well. 143 on the Welsh Highland Railway, built by Beyer Peacock in 1958 for the South African Railways. The concept was successful in markets where its unique characteristics were required, especially Africa. Such was its success that there are still a handful of Manchester built Garrett’s nominally in service today in Zimbabwe. Beyer Peacock survived into the diesel age, but only just. Despite producing a number of classes of diesel engines for British Railways, the overseas markets dried up – a combination of a rapidly shrinking empire and aggressive American manufacturers who eventually dominated the world export market. But by then, for all its virtues, steam was an anachronism. The world was now in the nuclear age, men were in space, and in Manchester, engineers just up the road at Avro were designing and building Vulcan bombers and scientists at the university were developing computers. Production ended in 1966. Although the company had transitioned from making steam locomotives to diesel and electric, the export market was dominated by American manufacturers, and the home market was adequately supplied by BR’s own factories. If anything there was too much capacity, as BR had inherited several large works across the country, and while some became maintenance works, others downsized and gradually closed. A very interesting and well-explained account- I had somehow lost the link in my mind between those lovely little Isle of Man locos and the mighty Garratts…your blog post stirred the grey cells on a journey of discovery- thanks for that! Looking at those aerial photos makes one realise how much manufacturing has disappeared from the scene. I wonder if there is anything left of Gorton “Tank”, the old works of the GCR which was still building electric locos in the ‘fifties? Thanks Iain. I suspect that there is no trace of the GCR works left – the Smithfield market covers a lot of the site and nothing stood out as looking old or railway related when I drove past. It might be worth further investigation if anything looks promising on google maps and geograph! Last time I passed the site on the train a few years ago (c. 2009), part of it was occupied by a GMP vehicle depot, which had been there for some years, on part of the works loco yard outside (I think) the erecting shop. Remains of the concrete panel perimeter were still in situ. The ‘bird cage’ bridge over the line, which connected Railway Street south of the rail line and Whitworth Street off Ashton Old Road by means of a walkway across the roof of the works was long gone. I attended Varna Street elementary scool, which was almost literally ‘across the road’ (Cornwall Sreet) from the works, and new that area fairly well.